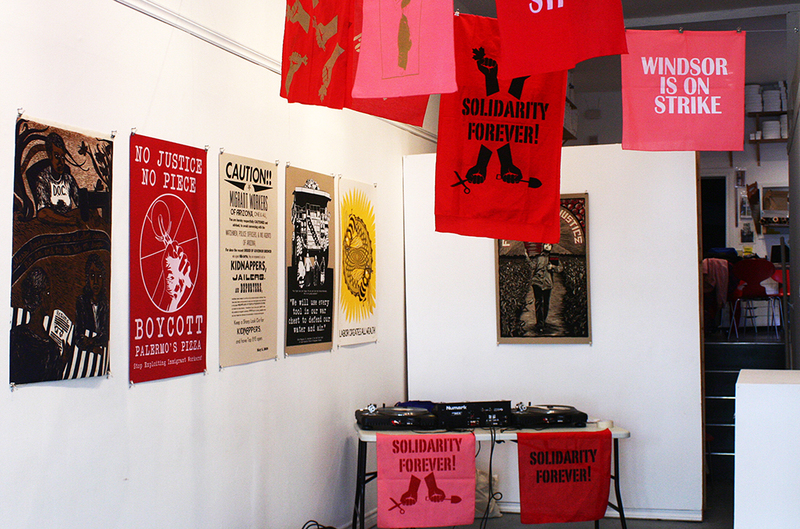 If you haven’t stopped by Civic Space in a while, the last two weeks have consisted of a very substantial labour-inspired print exhibition featuring works from Justseeds Artist Cooperative and a residency with Justseeds member Mary Tremonte. Mary came to stay with us at the beginning of May, just in time to participate in the annual May Day Parade. 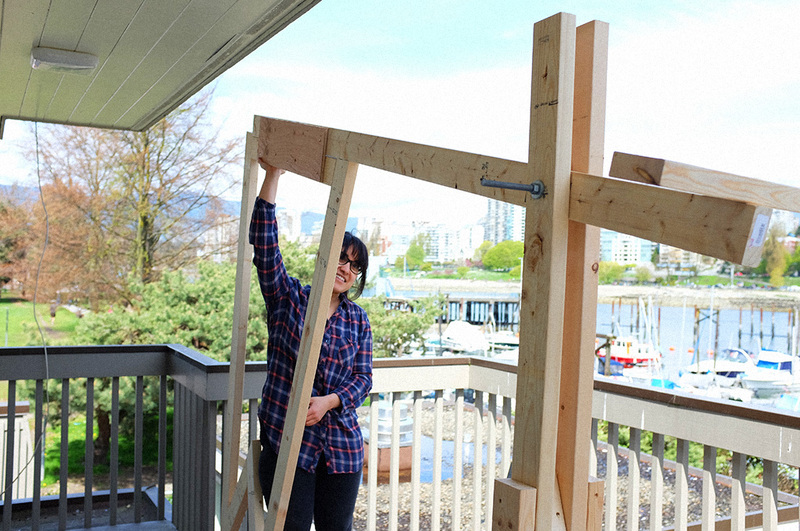 Besides the public silkscreening event she held at the end of the parade, Mary also led a workshop on May 7th at Civic Space as part of National Youth Arts Week. 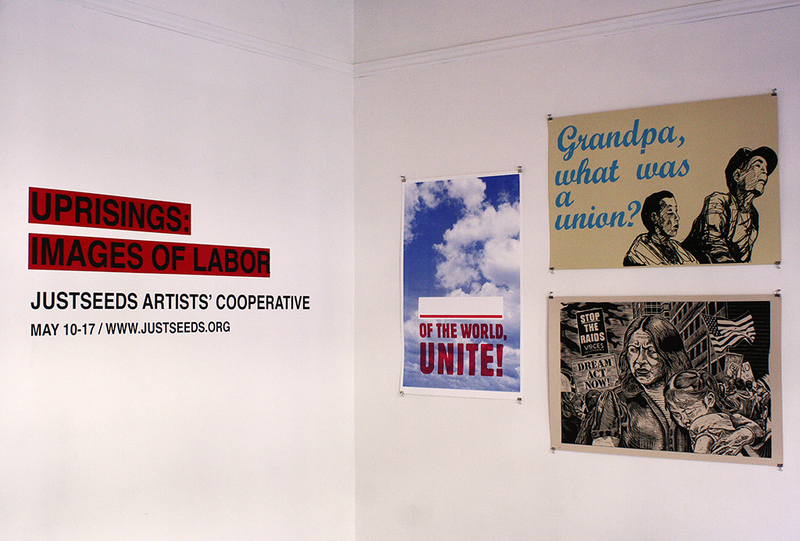 Mary also coordinated a printmaking exhibition of Justseeds Artist Cooperative works, centered around the issue of labour rights and the ethics surrounding the employer/employee relationship. 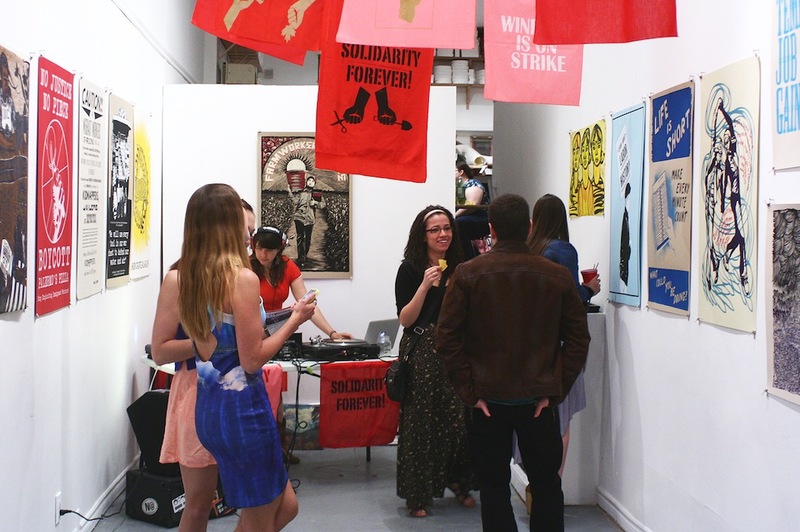 It was a fantastic showcase of Justseeds’ print works, and we highly recommend checking out the rest of them here. The prints were mostly the same size, with a few being a bit smaller and some being in landscape format. Some were silkscreen and some were relief prints, and they represented a variety of styles. 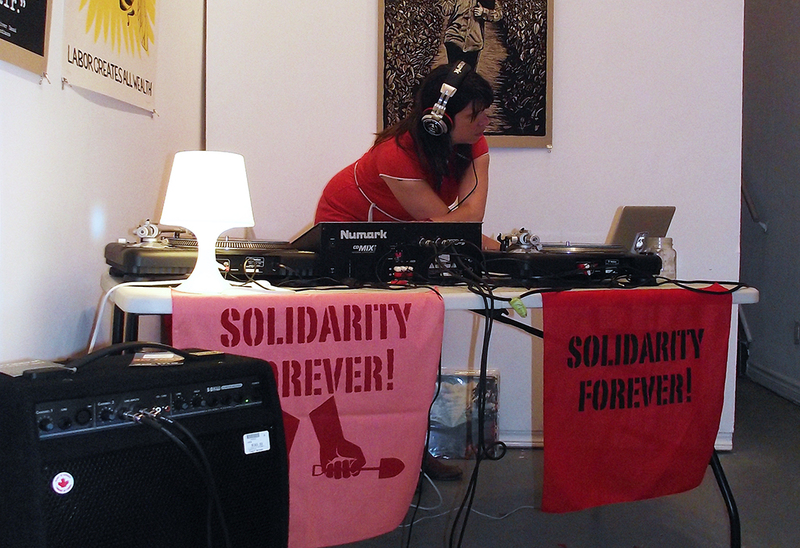 Mary set up her DJ equipment amongst the exhibition with the bandanas printed during her residency adorning the DJ booth. The combination of live music, large paper prints, and overhanging fabric prints activated the space in a marvelous way. Thank you to everyone who was able to come out; it really was a celebration. 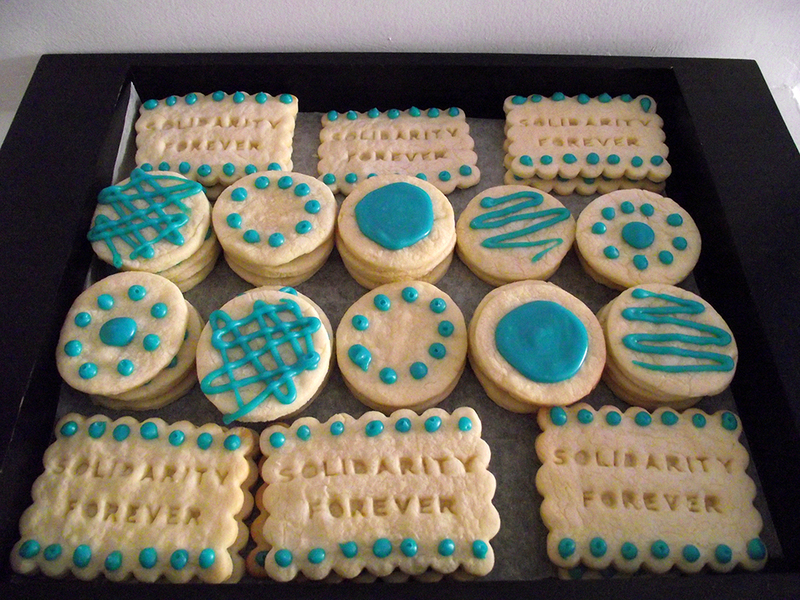 Erica, a student completing an internship with us, made these delicious cookies for the dance party with a custom letter-punching kit. DJ Mary Mack (Mary Tremonte) brought two turntables, a mixer, and a stack of her favorite records to spin during her dance party / closing reception. 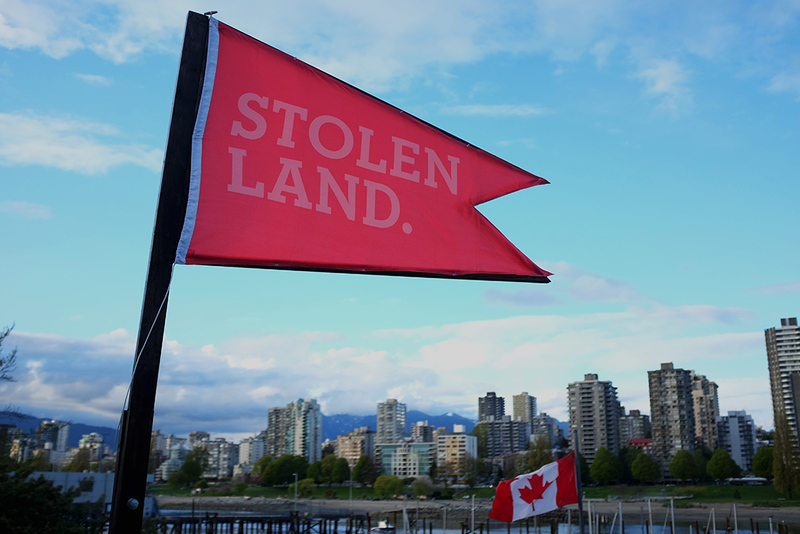 It was a blast and we hope we can work with Mary/Justseeds in some capacity again. SRSI, Day 20: Garden Party!!! 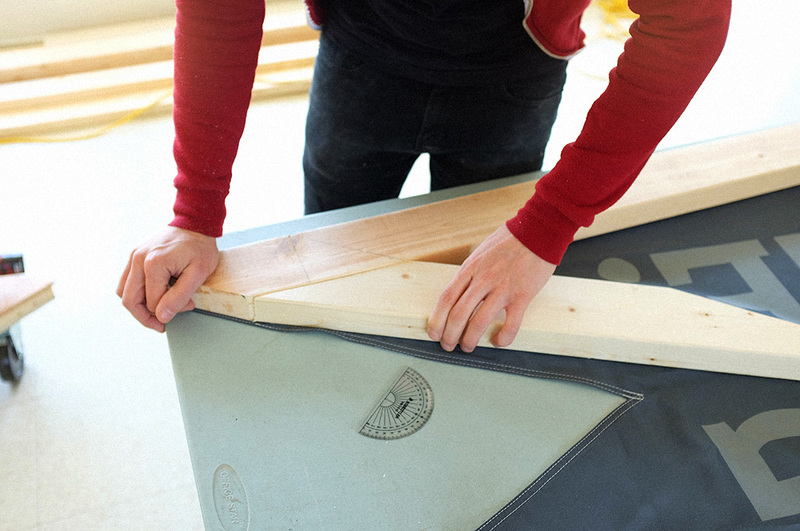 Wednesday was a big day in the SRSI spaces. Lea Bucknell held her Garden Party in 424 unveiling the portraits and stories that she made of Windsor residents, ProClick Factory arrives from Toronto, Thom Provost and Josh Babcock work on some hand-drawn diagrams. Josh Babcock starts working on his Invention Solution Hub, Robin Fitzsimons trains hard for her big trip to Caesar’s Windsor, Kids’ crafts are on display in 424 Pelissier, The Department of Unusual Certainties are holding consumer surveys, and Thom Provost talks to the community about his ideas. I am going to do a run-though of stencil making skillz, AKA technique, material, etc for spray paint. feel free to come out and get your stencil on, hope to see you there! -Michelle.